Be the first to share your favorite memory, photo or story of Bernie. This memorial page is dedicated for family, friends and future generations to celebrate the life of their loved one. After a period of ongoing health difficulties, Bernie passed away peacefully on Sunday, January 27, 2019 at Alexander Place, Waterdown, at the age of 82. Beloved husband of Pam for 33 years. Loving father of Mike (Linda), Dan (Chris) and Shawn (Joanne). Cherished grandfather of eight grandchildren. Predeceased by his parents Orville and Olive Carey. Bernie worked at Dofasco. 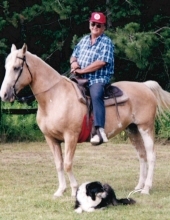 Known as the Pony Man, he owned and operated Circle B Ranch Riding Stable, and Pony Rides. He loved to play cards with anyone who would, and at the casino. Special thanks to the staff and volunteers at Alexander Place for the excellent care they provided for Bernie. Visitation on Wednesday from 7-9 p.m. at KITCHING, STEEPE & LUDWIG FUNERAL HOME, 146 Mill St. N., Waterdown, where the Funeral Service will be held on Thursday, Jan. 31, 2019 at 11 a.m. Reception to follow. Interment Millgrove Cemetery. Donations in memory of Bernie made to Equine Guelph would be appreciated by the family. "Email Address" would like to share the life celebration of Bernie Carey. Click on the "link" to go to share a favorite memory or leave a condolence message for the family.